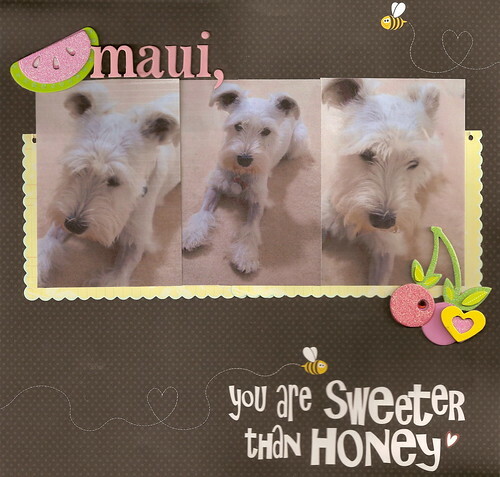 Today, Maui is ONE – well seven if you are counting in dog years! 1 sweet potato and 2 carrot pupcakes topped with chicken. "I can't wait anymore. Give me some, please!" "Holy moly! This is delicious, Mommy!" The pupcake was too big for her mouth, so she waited for us to cut it up into slices. "Just the way I like it!" "You can't get mad at me for getting crumbs everywhere!" Pupcake attacked by a Miniature Schnauzer. "I'm so full, but I have to keep going! Sooooo good!" "I wish we could celebrate my barkday everyday!" Last but not least, I wanted to share my latest layout. I totally loved this paper when I bought it at Scrapbook Territory in Berkeley, so I ended up buying more than one! Happy Barkday Maui! Yay! too bad you’re still a total troublemaker. “I’m a trouble maker, never been a faker..lalala” – weezer. Love the LO, bees are awesome until they sting you. However after watching The Bee Movie, I have a whole new perspective on those flying monsters! MAUI!!! Happy Birthday, cutie pie! Hope you get all the treats and toys that you want! Bark Bark and more barks! i want a cake. can you make me one topped with carnitas? CUTE!! Those “pupcakes” are just adorable! I love that you topped it with chicken; what a dream come true for a doggy! The pictures are really darling, glad you posted ’em. HAPPY BARKDAY Maui!!! <– from MoJo, Wrigley & Cubby. Wait…. I’ve seen that plate before. You served ME cookies on that plate!! And Maui eats off it?!!?! … I feel so honored! So cute! Happy birthday Maui!!! Those pictures are too precious! Happy birthday, Maui! Lovin’ the pupcake idea. and i love that page sarah. cutie maui. Happy Birthday , Maui! The cakes look so yummy! Hope you get them again sooooon! Love the lo! Very cool title! Happy BARKDAY, Maui! Cute photos… lovin’ the pupcake! now if only i could have some of that cake!! Happy Birthday Maui!!! You’re a big girl now!! Sarah, those pupcakes actually do look scrumptious enough to eat! LOL! I’m such a glutton! That’a a really cute layout of Maui too! Holy Moly! Maui is SO cute! I absolutely LOVE those photos. And the pup cake, so precious. Your dog is gorgeous! And the layout is darn cute too! Ooooooo HAPPY BIRTHDAY MAUI!!! Yummy cake and totally sweet layout!!! Your LO is as cute as Maui! The cake looks good too! Cheers! happy barkday maui! yummy treat eh! Sorry I’m a bit late, Maui!!! Wishing you a wonderful belated birthday. Looks like your mommy spoiled you rotten:) I still think you are the cutest thing in the whole world. That is so sweet!!! Happy birthday Maui!!!! oh how cool!!!! I totally have a birthday party every year for our topanga!!! Maui is adorable!!! Happy Birthday Maui!! !